about their operations, the data from this project will reflect current finances of these conservation practices as they are used here on our soils. but few farms complete the accounting of where the extra P comes from. We have a project to work with several farmers and their feed consultants to collect data on the extent of P imported to local dairy farms. This is good information to have, but really the issue is what to do then? Not all P is leaving the farms, and that is why farmers use the P-Index to better understand the risk of P loss and “plug” any leaks in the farm system. will also see how good the cover crops perform that we planted last fall. The Vermont Required Agricultural Practices rules affects all farmers this year, and so it affects our Extension work. Focus on Agriculture means a focus on helping you to learn (like Poop Skool) and then figure out the best next steps to take (whatever that is). Give us a call, or just come to the meetings that we host with the Champlain Valley Farmer Coalition. This is a great way to keep up with new ideas so you can deal with changing times in Vermont agriculture. Farmers are time-strapped folks. Having to report the same thing to multiple agencies can seem like a waste of time. Welcome, ACRSI. ACRSI is a joint effort among producers, Farm Service Agency (FSA), Risk Management Agency (RMA), and the crop insurance industry. The Acreage Crop Reporting Streamlining Initiative (ACRSI) replaces duplicative crop reporting of common acreage information by producers to both the Farm Service Agency (FSA) and Risk Management Agency (RMA). Producers now have multiple ways in which to report their common acreage data and will not have to report the same information twice to both FSA and their crop insurance agents, saving time and potentially reducing inadvertent errors. ACRSI is available nationwide for the 2017 acreage reporting season. Buffers and Grassed Waterways, Oh My! on your farm. We will discuss: New RAP rule on buffers in effect April 15, 2017. All farmers covered under the RAPs will be required to have a 25-foot buffer on streams and a 10-foot buffer on ditches. Let’s face it, this will mean adjusting plowing and planting practices this spring. 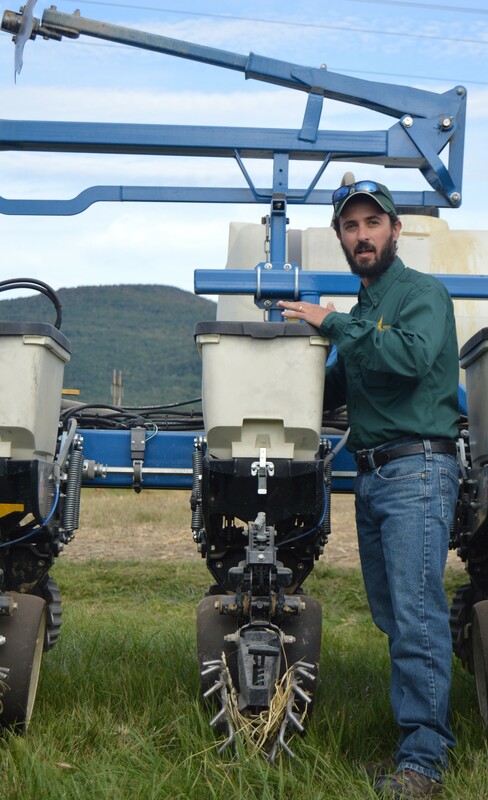 For the third year, our team is hosting no-till corn planter clinics in coordination with Champlain Valley Farmer Coalition. Are you on our e-mail list to find out dates and details? Like conventional till, successful no-till comes down to healthy soil, a properly set-up planter, and the right timing: they’re even more critical since you can’t correct mistakes with an extra harrow pass! 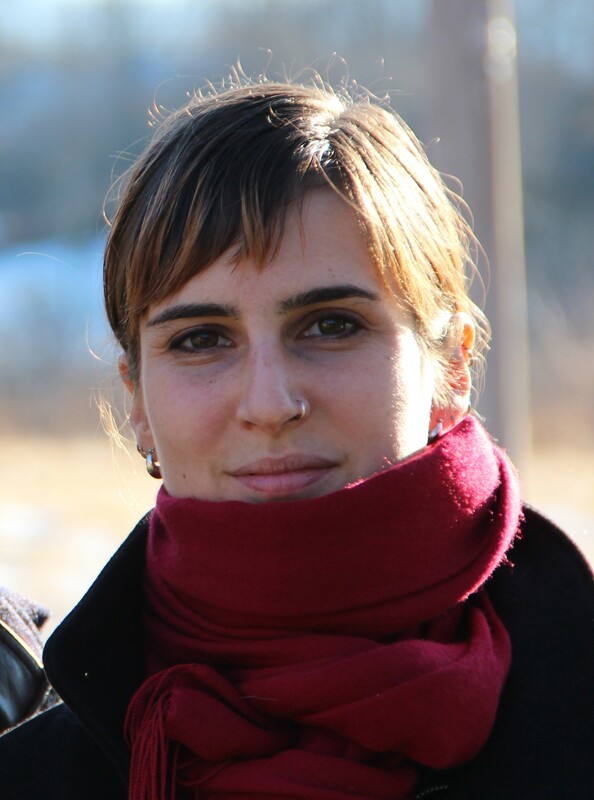 Claire Bove is the newest addition to the Middlebury UVM Extension office, hired in February as the Vermont Coordinator for the High School Equivalency Program (HEP). HEP helps eligible migrant and seasonal farm workers and members of their immediate family obtain the equivalent of a high school diploma, and subsequently gain employment or pursue postsecondary education. All participants receive a free tablet and access to online curriculum available in both English and Spanish, which enables program participants to complete an individualized and self-paced course of study in preparation for passing the GED exam. This is a new program offered in partnership with the other New England states of Maine, Massachusetts and New Hampshire, and Claire will be working hard to build these partnerships and to recruit students across the state in hopes of graduating 20 Vermont individuals a year. Claire isn’t totally new to UVM Extension or to the Vermont farmworker population, as she has been working with the Migrant Education and Bridges to Health Programs as a Recruiter and Health Promoter since last summer. The Migrant Education Program provides free educational support services, English classes and life skills training to eligible children and youth who work or whose families work in seasonal or temporary agriculture. 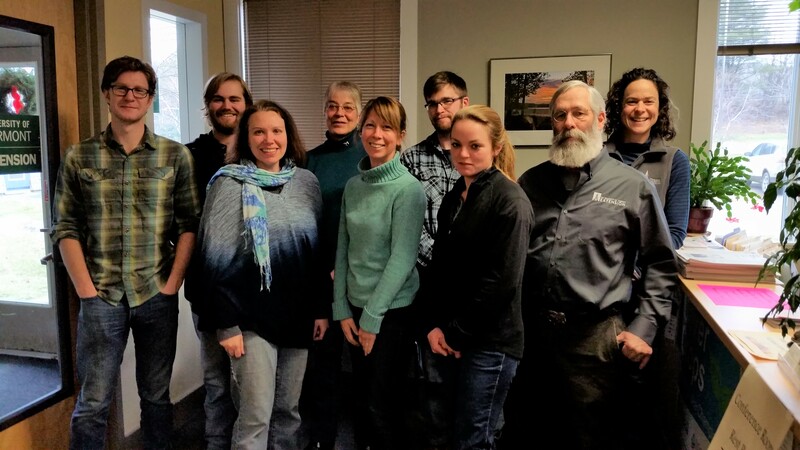 Bridges to Health is a health outreach program that offers care coordination and supports health care access for migrant farmworkers in Vermont. Claire has enjoyed the opportunity to provide farmworkers with valuable access to education and healthcare resources through her work with these UVM Extension programs, and she is excited to pursue this new opportunity with the High School Equivalency program and to continue serving the Vermont farmworker community. Claire grew up in Brandon, VT and completed her undergraduate studies at UVM focusing on biology and Spanish. She has since lived in Austin, TX, Chicago, IL and multiple locations in Spain, and has spent time cooking professionally, studying to be a sommelier (wine steward), teaching English, and working in research. She is now happily settled in Cornwall, VT with her husband and young son, where she enjoys being outdoors, gardening, cooking for friends and family, and fishing. This winter we have been very busy putting together workshops and meetings focused on new manure spreading rules and how farmers and custom applicators can make them work on their farms. Manure or other “agricultural wastes” cannot be spread within 25 feet of a stream and 10 feet of a ditch. There are also new restrictions when spreading in floodplains, training requirements, and recordkeeping requirements. Everyone under the certified small, medium or large farm definition must spread manure according to a Nutrient Management Plan (NMP), and all farms must apply manure based on agronomic rates. 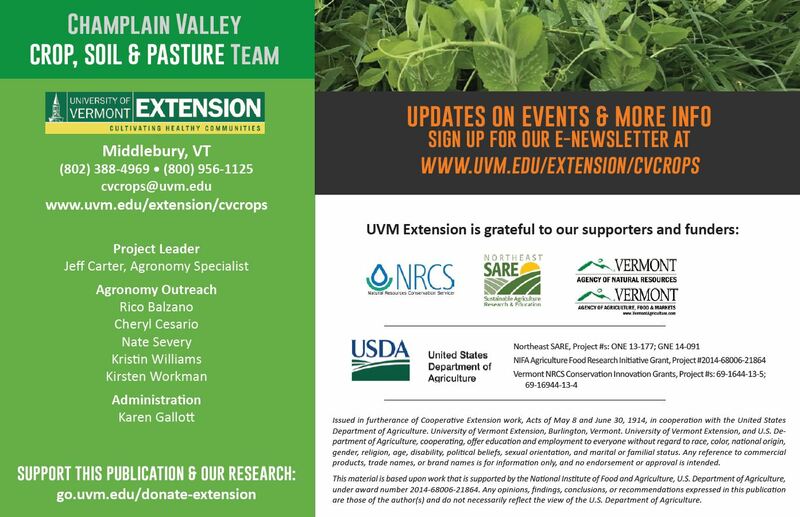 We received a grant last fall from the Vt. Agency of Agriculture, Food and Markets (VAAFM) to develop an educational and certification program for custom manure applicators in coordination with the Northwest Crop and Soil Team. This program will be very similar to the Pesticide Applicator Program: applicators will have to take and pass an exam, recertify yearly, and accumulate 8 hours of professional development over 5 years to maintain the certification. The first exam will take place next winter, most likely before Christmas. 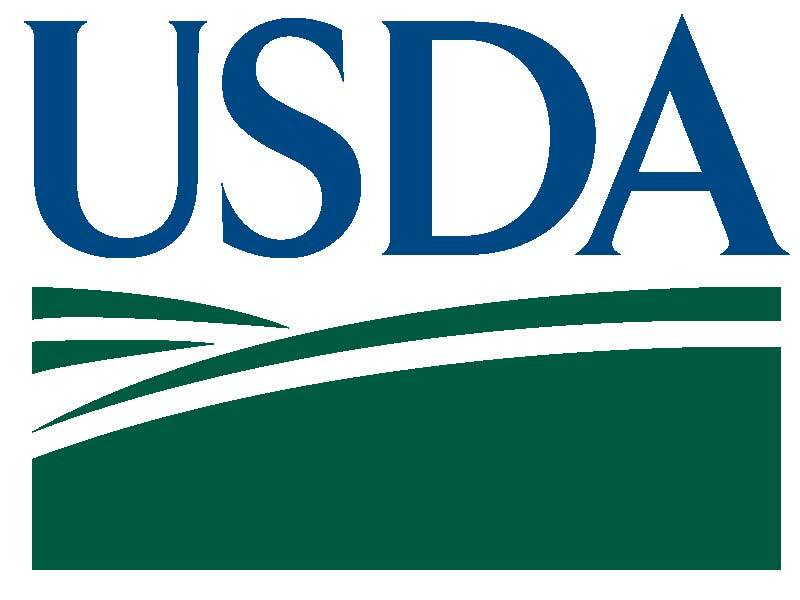 For this upcoming cropping season, even though custom applicators will not have their applicator certification, these businesses will be expected to follow all of the RAPs pertaining to spreading manure, including keeping application records. To help everyone learn about the RAPs and what records need to be kept, we helped organize 3 custom manure applicator workshops and 5 farmer and custom applicator employee workshops throughout Vermont. At these events, attendees learned about the new rules and what is expected from them. These workshops also provided a forum where people were able to ask questions and engage in open dialogue with VAAFM staff. At each meeting there were good conversations that generated important questions and it is great to hear respectful conversations. Even when people do not agree they can still have a good discussion. We are here to help applicators sort out their questions about the RAPs and will continue to keep the dialogue going. Going into the 2017 cropping season, I believe that recordkeeping is going be a big obstacle for many people. Good recordkeeping takes extra time, patience, and dedication, even on a small farm. If someone is not prepared, recordkeeping could be challenging for a custom applicator that spreads manure on thousands or even tens of thousands of acres on many different farms. At our meetings, we stressed that the key to good recordkeeping is to seamlessly integrate it into your business. Some are already doing this through technologies like UVM’s goCrop™ or flow meters where fieldby-field data is automatically recorded and downloaded into a computer. Other people have put recordkeeping logs on the back of employee timesheets and require that the employee fill out the log in order to be paid. 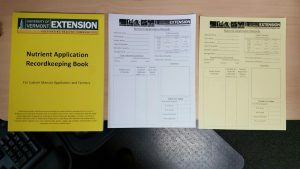 For custom applicators who need help with recordkeeping, UVM Extension has developed a recordkeeping book (copies available at our office). 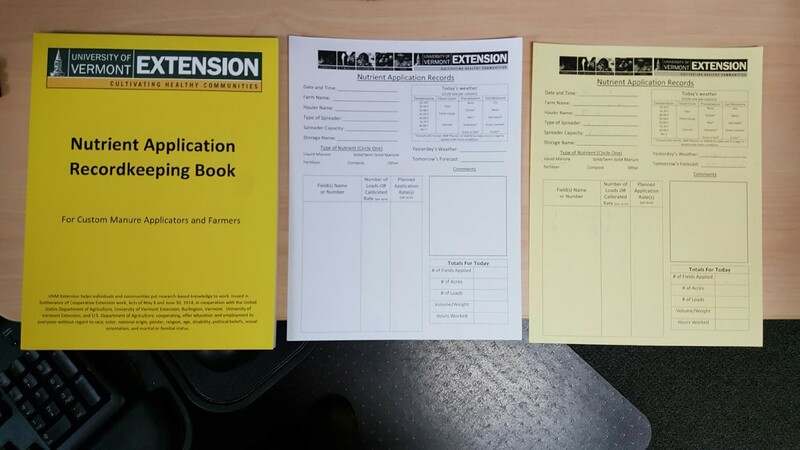 Each page has a carbon copy so at the end of the day the applicator can fill out the page, tear off the top and give it to the farmer for his/her records, and then tear off the carbon copy and put it in a file at home. All of these systems are acceptable, but it is important to use the system that will work best for you, and will help strengthen your business going into the future. Even though there is an initial inertia required to make record keeping successful, the hope is that it can also pay off for the farmer by documenting and improving on agronomic practices. If you have questions about manure application or would like more information or materials on record keeping, contact our office. If you do not have an NMP and need to obtain one, contact your local conservation district or NRCS office for funding possibilities. Rotations are tracked with the grazing chart at Elysian Fields in Shoreham, Vermont. There is a saying, “You can’t manage what you don’t measure,” and this holds true for pasture as well as crops. There are many ways to monitor and keep records of pasture yields and grazing activity. Personally, I am a fan of whatever recordkeeping system works for the individual farmer, as it has to be efficient, straightforward and provide useful information to be worthwhile. were interested could try them out and evaluate their usefulness. the field or paddock where the animals have moved, a pattern forms providing a visual record of the entire season laid out at once. With this chart, there is no flipping pages back and forth in a calendar to figure out what animals were where and when. I personally like being able to look at a chart and see how many days since I last grazed a given area, and it helps me readjust my plan. At the end of the season, I find it informative (or in the case of last summer, depressing) to see how many times I was able to graze a given field. For experienced grazers, try planning a month ahead by filling in the chart in pencil and then have fun seeing how close you were. all the information is at his fingertips. I would love to hear from farmers who are utilizing some of the newer “apps” such as PastureMap™ or GrazingCalculator ™. Also on the horizon is goGraze™ currently in development as a companion to UVM Extension’s goCrop™ nutrient management software. Ultimately, there are tools available for everyone, whether you want to enter data on the go with your phone or like the comfort of having a tangible paper record. For the last 5 years, our team has had grant funding from the USDA to do research and demonstration projects investigating novel ways of cover cropping in corn silage and soybean systems in Vermont. We started with a small project in 2013 in Ferrisburgh at Deer Valley Farm comparing 2 different cover crop mixtures planted into the standing corn and drilled after harvest. That project was successful and provided us with enough preliminary data to start investigating additional cover crop mixtures and planting timing on a larger basis. 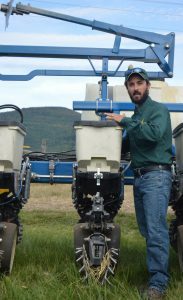 In 2014, we started our NRCS Conservation Innovation Grant, “Better Cover Crop Mixes in Vermont.” This project enabled us to evaluate several three-way cover crop mixtures alongside a winter rye monoculture. The cover crops were planted into standing corn (at V5/V6 growth stage and at tassel) as well as drilled after harvest. Similarly, we interseeded into soybeans at R3-5 and R6-8. 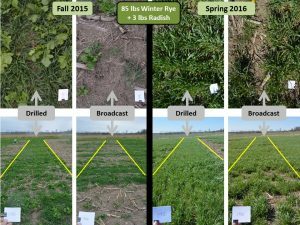 As a result, we ultimately evaluated 15 different three-way cover crop mixtures during 29 different planting events for a total of 319 research plots. This work could not have happened without our farm partners. For this project alone, we collaborated with 10 farms on 13 fields in 7 Vermont towns. So what? you may wonder. 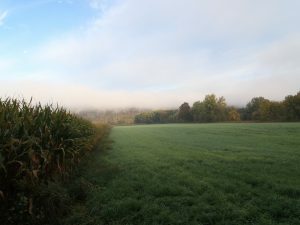 These plots provided us with valuable data to share with producers, NRCS staff, technical service providers and agency folks, and that information is helping us make sound recommendations for successful cover cropping in Vermont. 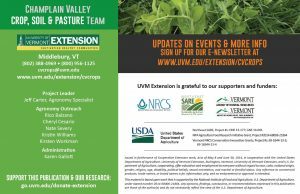 However, the true value of this project (and our other cover crop projects) is the ability to enable hundreds of Vermont farmers to witness, learn about and adopt this practice. In this single grant project described above, we were able to do some amazing outreach to farmers. This included 12 field days, 6 presentations, 7 newsletter articles and 5 Across the Fence television episodes. Our field days involved over 200 farmers, 61 agricultural business employees, and 112 agency staff. Our workshops and conferences reached 153 farmers, 81 ag. business employees and 221 agency staff. And while that in itself is a tremendous feat, the real so what is that we have seen exponential increases in the adoption of cover crops in Vermont over the last 3 to 5 years. According to the U.S. Department of Agriculture’s Natural Resources Conservation Service (NRCS) data, “Vermont farmers planted a record-setting 25,727 acres of cover crops on more than 2,000 fields in 2016 on approximately 25% of all annual cropland in Vermont. That’s a 58% increase in the acres of protective winter cover crops planted in 2015.” By my count, it is a 250% increase from 2014. While these research and demonstration projects are by no means the sole reason for this impressive rate of adoption, I do believe they are an important piece of the puzzle. 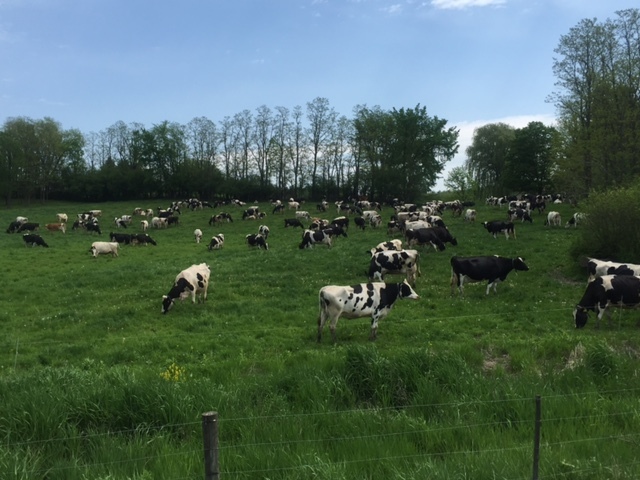 Enabling farmers in the Champlain Valley to approach these conservation practices with solid, local information that allows them to be successful. They are able to investigate species, planting methods, potential pitfalls and see for themselves when and if these cover crops make the most sense on their farms, in their soil and weather conditions and with their equipment. And most importantly they are getting the most out of their cover crops by establishing them in a truly effective way, meaning the cover crops are functioning as intended and providing erosion control, taking up manure nutrients, and protecting water quality. In addition, the farmers are figuring out how to do it more profitably, utilizing these cover crops for forage or as a key component in their no-till systems, using less seed and planting it better, and even growing their own seed. Essentially, Vermont farmers are making them an integral part of their farming operations. This is the true meaning of adoption. Not just throwing seed out there because there is cost-share money, but REALLY MAKING IT WORK. An example of cover crop research plots comparing broadcasting seed on the soil surface versus planting with a no-till grain drill. Both were planted on the same day, after corn silage harvest, on Vergennes clay soil, and received aproximately 4,000 gallons of liquid dairy manure/acre. Pictures were taken about two months after planting and in the following spring. obvious, lesson was the correlation between soil health practices and crop yields. So, how do soil health practices influence yield? Research suggests soil health can improve yields. It is important to note our project focused on demonstration, not replicated research. We compared no-till and conventional/reduced till corn silage on 5 farms with clay fields in our region. A simple t-test revealed no significant difference in yield between no-till (19.1 tons/acre) and conventional (19.2 tons/acre). More importantly, we were able to demonstrate that a farmer can grow no-till without yield losses, and be successful with good management practices. A yield gain might take time as the soil builds up its condition. 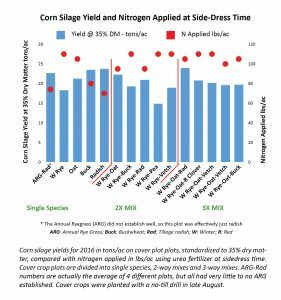 for more available nitrogen in the soil at the time of a pre-sidedress nitrogen test (PSNT), therefore requiring less nitrogen. Surprisingly, legume mix covers had good fall biomass, but that did not translate into more N mineralization. 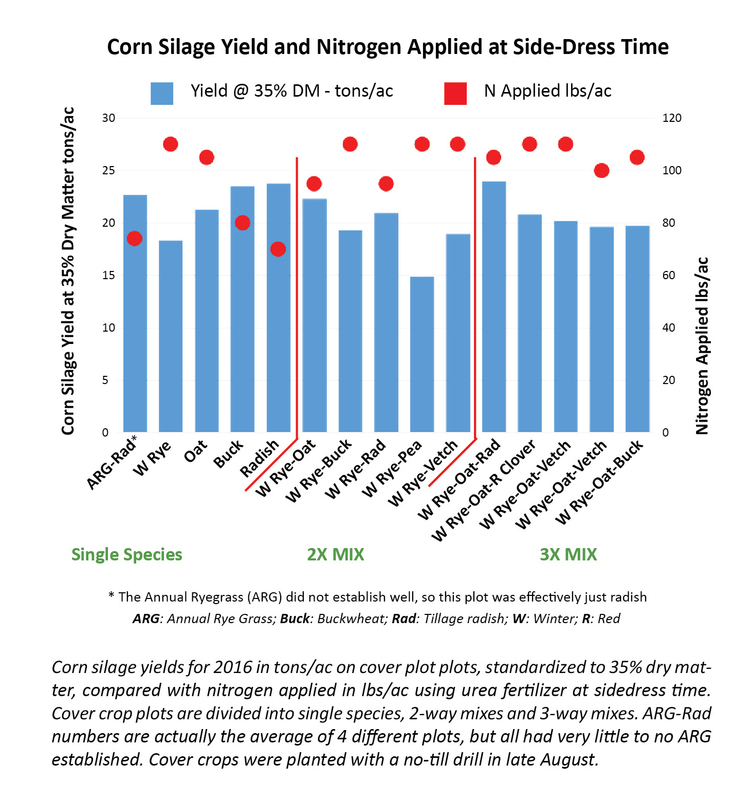 yield and compared that to nitrogen applied (see graph). The winter rye plot had a lower corn silage yield and required more nitrogen. Other than the nutrient effect of less uptake and slower decomposition, there may have been a physical barrier created by the standing rye crop, which was particularly vigorous in the spring. However, our three-way mix (winter rye – oats – radish) actually had the highest average corn silage yield, even though it required more N at PSNT time than the pure radish stand. So, do not go abandoning your winter rye just yet. In fact, we think this three-way mix has promise and we are looking for a mix that gives both fall and spring soil conservation. Radish alone will winter kill, which may be good for mineralization, but not as good for spring soil conservation. Oats also winter kill but provide faster fall soil cover than rye by itself. When using an over-wintering cover crop, it is clear that timing and success of termination is critical for subsequent crop yields. Nitrogen mineralization may happen later in the season with a plant such as winter rye that has a heavier carbon content. In a no-till system particularly, you may need to adjust your nitrogen rates/timing and put more on upfront. If you are using cover crops, a PSNT seems like a wise investment. It is also important to remember that soil health is a long game, and it may take time to see the results of your labors with cover crops. We have replicated this project by replanting these cover crops in the fall of 2016, this time planted in September, and will look at this again this coming season. 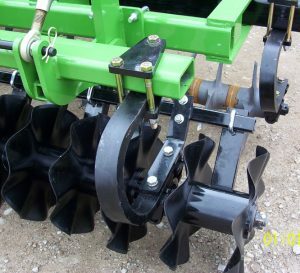 VERTICAL TILLAGE: HOW DOES IT FIT IN THE TILLAGE CONTINUUM? soils? What about ruts leftover from harvest? 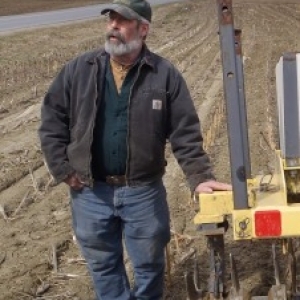 Vertical tillage offers a solution with minimal soil disturbance and virtually no soil inversion, thereby maintaining a natural soil structure essential for success when otherwise no-tilling. Vertical tillage implement (Great Plains) with straight cutting disks, rotary harrow and rolling baskets. Aerator machine (Gen-Til) equipped with coulters for vertical tillage. (with concave disks), create restriction layers that impede water movement and root growth. These implements shear or smear the soil, which can lead to compaction in or below the tillage depth. cover crop seed in the fall, incorporating manure, and leveling out ruts from harvest or other field activities. concave disks or straight disks set on an aggressive angle. These set-ups can help incorporate residue and manure, but increase the chances of smearing soil and creating compaction in the tillage zone. 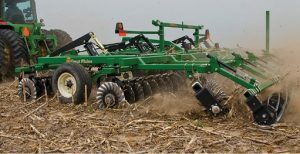 Care must be taken not to use ANY tillage implement when soil moisture is too high, as more harm than good will be done. Nutrient Management Planning Update Workshop. Tuesday March 7, 10am-2pm, Middlebury Extension Office.This workshop is part of a series for previous attendees of our NMP classes to update their plan for 2017. Additional days by appointment, contact Kirsten (802-388-4969 ext. 347). Custom Manure Applicator Training. Wednesday March 8, 10am-2pm, Vergennes American Legion this location has changed. This workshop is part of a series of classes for custom manure applicators only. Contact Nate for more information (802-388-4969 ext. 348). Coordinated with the Northwest Crop and Pasture team. Following the New Required Agricultural Practices (RAPs) in the Floodplain – for farmers. March 16, Conants Riverside Farm, Richmond and April 4, Middlebury Extension Office, 10am-12pm. Both workshops will be discussing floodplain agriculture including: manure spreading ban, incorporation of manure, cover crops on annual cropland, and limitations of stacked manure. For more information contact Nate (802-388-4969 ext. 348). Manure Training for Farm Applicators. March 21, Woodnotch Farm, Shoreham and March 23, Leach Farmily Farm, Pawlett, 10am-2pm. For custom applicators, farmers and seasonal farm employees. Addressing RAPS – topics include: buffers along surface water and ditches, manure spreading ban dates, soil conditions for manure application, how to read a nutrient management plan (NMP), methods to minimize run-off of manure and its associated nutrients, and record keeping requirements. For more information contact Nate (802-388-4969 ext. 348). No-Till Planter Clinic. April 6, Gosliga Farm, Addison, 10am-2pm. For more information contact Rico (802-773-3349 ext. 281). More information or questions about any of these events can be obtained by contacting our office. Organic Dairy Producers Conference. March 9, 9am-4pm, Vermont Technical College. Hosted by the UVM Ext. North West Crops and Soils Team. More information can be found here. Annual Grain Growers Conference. March 23, 9am-5pm, The Essex Resort & Spa. Hosted by the UVM Ext. North West Crops and Soils Team. More information can be found here. 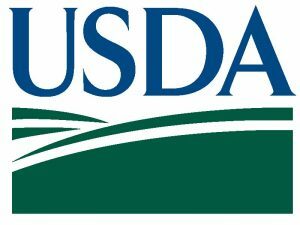 Listening Tour: Agency of Agriculture (VAAFM).Ongoing, multiple dates and locations. More information can be found here. Farm Business and Budget Clinics. UVM Extension. Ongoing, multiple dates and locations. More information can be found here. Winter Manure Spreading Ban will be lifted April 1, 2017. Even after this date the VT Agency of Agriculture, Food and Markets (VAAFM) prohibits spreading on frozen, saturated or snow covered ground. Questions should be directed to VAAFM.